We were lucky with the weather yesterday getting pretty well what the forecast predicted. We were very busy from early on and by lunch time there were 27 cars in the car park. The wind was in the S.W. all day which was much better than the easterly on Wednesday. We had several visitors who all had a good time and we did manage to get everyone flown but it did mean flying until quite late. Welcome to Graham F. who has joined after a trial lesson last year and to Rob, a young man who lives fairly locally and had a couple of flights with Allan, he is seriously thinking of joining us and learning to fly. We only had one shower and that was at lunch time, it was heavy and lasted around 30 mins but the sun soon came out and dried things out very quickly. It was overall a good day but I am sorry that some members had to wait until the end of the day to get their flights in. We will do things differently next time. The thermals were very weak for most of the day but there were some good flights and it was still thermic at nearly 6pm. Best flight of the day was by Geoff W. and Mark P. who managed a very creditable 30mins. Bob H., Stewart A., George S. all did very well with extended flights and Phil P. and Chris B. had a good flight in the Barge, from the ground it looked like they were impersonating a helicopter ! Average Flight Time……….8 min. (which included several S.C.B’s). The Doughnuts all went early on, must remember to buy another couple of packets next time. 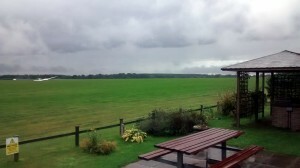 Proof that we’re actually on a hill: The lunchtime clouds were passing below the airfield. This entry was posted in Flying reports and tagged flying report, gliding by admin. Bookmark the permalink.